Scunthorpe are clearly reaping the benefits of making the decision to change their manager in the early stages of the season, after just four games in fact. After winning the opening fixture at Coventry, the Iron then drew 1-1 with Walsall, going out of the Carabao Cup at home to Doncaster. They were then beaten 3-0 at Sunderland before a 5-0 hammering on home soil to Fleetwood spelt the end for Nick Daws, who had only been given the permanent job in the summer, having led the club to the play-offs, losing out to Rotherham in the semi-final while in caretaker charge. Scunthorpe United chairman Peter Swann felt he had to swiftly rectify his recruitment error though, saying: “This was not a great decision by me. “For us we’re just not seeing the returns we would hope to at this particular stage. Swann wanted an experienced man to take charge, and certainly got that by appointing Stuart McCall, who had been out of work since leaving Bradford City in February. Taking over on August 27, McCall is yet to experience defeat in the Iron dugout, starting with a 1-1 draw at Accrington and then drawing 3-3 with Rochdale. The first victory came in a 3-2 success at AFC Wimbledon, with Shrewsbury seen off 1-0 at home, before a goalless draw at Burton. Tuesday night’s impressive 5-3 triumph over Charlton made it 10 points from the last 12, taking United up to ninth, a point above Luton. Skipper Rory McArdle knows a trip to Kenilworth won’t be easy by any means, telling the club’s official website: “We know that it is going to be a difficult game as all the matches are. “Each team causes us different problems, but it’s something that we are prepared for. “On Tuesday night, we knew that we were going to have to defend, so equally on Saturday, we are going to have to be at it again. During the summer, the Iron had to deal with a number of players leaving, Hakeeb Adelakun (Bristol City), Conor Townsend (West Brom), Murray Wallace (Millwall) and Duane Holmes (Derby) all earning moves up the footballing echelon. They were able to bring some new faces i though, defender Cameron Borthwick-Jackson on loan from Manchester United and experienced centre half James Perch who has played in the Premier League for Newcastle, signing on. Olufela Olomola came in from Southampton, as did Chelsea’s Ike Ugbo, while McCall also added Rangers goalkeeper Jak Alnwick and Chelsea striker Ike Ugbo on loan until January. Team news: Luton are getting close to a full squad with the only definite absentees Luke Berry (knee) and Lloyd Jones, as striker Danny Hylton is back in full training. For the Iron, midfielder Matthew Lund is in contention following a one-match suspension. On-loan striker Ike Ugbo (hamstring) is being assessed by parent club Chelsea, while James Horsfield (groin) is a doubt, but James Perch (ear infection) should be available. Top scorers: Hatters: Elliot Lee (3). Iron: Josh Morris (4). Milestones: Manager Nathan Jones will lead the Hatters for the 150th time against Scunthorpe tomorrow. Since taking over in January 2016, he has won 73 games, drawn 41 and lost 35. Tuesday night’s 2-1 win at Oxford was defender Dan Potts’ 100th appearance for the club too. The defender signed in the summer of 2015 and his last-gasp winner was his ninth goal since arriving. Man in the middle: Kevin Johnson. Taken 10 games so far this season, showing 32 yellows but no reds. Refereed Luton twice last year, the 2-1 win over Mansfield in April and the 1-0 defeat at Barnet back in August. Prior to that, had Hatters in a 1-0 defeat at home to Leeds United in the EFL Cup and then the 1-0 loss at Mansfield in February 2015. Assistants are Christopher Kidd and Gregory Read, with Hristo Karaivanov the fourth official. In charge: Stuart McCall, 54-year-old who had a lengthy playing career, making over 750 appearances and also winning 40 caps for Scotland, netting in the 1990 World Cup tournament. Began at Bradford City, spending six seasons at Valley Parade, moving to Everton when he scored twice in the 1989 3-2 FA Cup final defeat to Liverpool. Headed to Rangers in 1991, winning six league titles, three Scottish Cups and two Scottish League Cups, before a return to Bradford City where he captained them to the top division. After four campaigns he moved to Sheffield United, retiring as a player in 2005. Had been part of the coaching staff during his second spell at Bradford, briefly serving as caretaker-player manager in 2000. Carried on coaching at Sheffield United and was assistant manager to Neil Warnock until May 2007, when he went back to Bradford for a third spell, this time as manager. Left in February 2010, and named Motherwell boss later that year, staying at Fir Park for four years, resigning in November 2014, while he had also been on the backroom staff for Scotland under Gordon Strachan. Became Rangers boss in March 2015, but left the club in the summer, going back to Bradford for his second stint in charge on June 2016. Was sacked in February 2018 and then named Scunthorpe boss in August. View from the opposition: Stuart McCall talking to the club’s official website - “As in recent games, we’re again facing a side who are in good form. It’s another challenge, but one we’ll be up for. “I’ve watched their home game against Charlton and will watch their match from the other night when they played Oxford. “We’ll always be aware of the opposition, it’s naïve, arrogant and ignorant if you think you can just go there and play your own way. You have to be aware, but the other side of it is to have belief in what you’re going to do, and we have that. “They got a draw at home to Sunderland and were unfortunate to lose down at Portsmouth on the opening day, but they look comfortable at this level and I think they’ll have aspirations of finishing at the top end. Played for both: Frank Soo was first player of Chinese origin to play in the English Football League, beginning his career at inside-left, though later became more established at half-back. Started out with Prescot Cables, joining Stoke City for a £400 fee in January 1933. Lost most of his best playing years to World War II, as he was sold to Leicester City for £4,600 in September 1945, and then moved on to Luton Town 10 months later for £5,000, making 78 appearances and scoring five goals. Joined Chelmsford City of the Southern League in May 1948, retiringd as a player after two seasons. Went on to coach various different European clubs in the 1950s and early 1960s, including Helsingin Palloseura, St Albans City, Padova, Norway at the 1952 Summer Olympics, Eskilstuna, Örebro, Djurgården, Oddevold and AIK. Returned to England in June 1959 to manage Scunthorpe United, leading them to 15th in the Second Division, before he resigned in May 1960. Managed IFK Stockholm (Sweden), Fredrikstad (Norway), and Akademisk Boldklub (Denmark), before his death in January 1991. One to watch: Josh Morris - Midfielder who started his career at Blackburn, having loans spells at Yeovil, Rotherham, Carlisle and Fleetwood until joining Bradford in July 2015. Signed by Scunthorpe in July 2016 as has been a revelation ever since moving to Glanford Park. Scored 20 goals in his first season, then 12 last term and is already on four this time, making it 36 strikes in just 115 games. 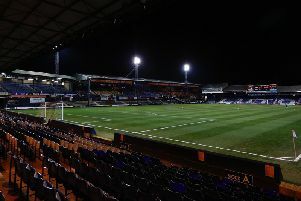 We’ve got form: Luton have met Scunthorpe just six times at Kenilworth Road in their history, starting with a 0-0 Division Two draw back in April 1961. The record is split down the middle, Luton winning two, losing two and drawing two, scoring nine and conceding seven. They did enjoy a 4-1 win in June 2000, Matt Spring (2), Stuart Douglas and Phil Gray on target. Last time out: This game will be the first time the two sides have met since that famous day in Wembley back in April 2009, when Town won the Johnstone’s Paint Trophy. Chris Martin, Tom Craddock and Claude Gnakpa all scored as the Hatters ran out 3-2 winners to lift the trophy in front of 55,378 supporters. Town were beaten 3-2 in their most recent clash with the Iron at home, that a Division Three encounter back in February 2002. Peter Beagrie opened the scroing on nine minutes for United, while Steve Howard levelled (36). Wayne Graves netted on the stroke of half time, but Matt Taylor appeared to have rescued a point, until Matt Sparrow grabbed a last minute winner. Hatters: Carl Emberson, Chris Coyne, Dave Bayliss, Russell Perrett, Matt Taylor, Adrian Forbes (Dean Crowe 73), Kevin Nicholls, Matt Spring, Jean-Louis Valois, Steve Howard, Gary McSwegan (Emmerson Boyce 57). Subs not used: Mark Ovendale, Aaron Skelton, Paul Hughes.